From L to R: Jennifer Pollack Reiner, Laura Gabella, Kerri Weingard, Eileen Melniker (captain), Diane Ventura, Katharine Levitt, Lucia Hoffman, Karen Urban. From L to R: Marc Robert Benou, Arnold Resurreccion, Mark Stellwagen, Marcy Borr (co-captain), Edward Poole (captain), Herbert Joel Kessler, Christian Richard Baker. On October 28, the women’s tennis team from New York City, representing the USTA Eastern Section, finished second at the USTA League 4.5 Adult National Championships held at the Reffkin Tennis Center in Tucson, Arizona. The New York City team lost to a team from Natick, Mass., 1-4, in the Championship match. Earlier in the day, the New York City team defeated a team from Middle States, 4-1, in the semifinals. They advanced this far by winning their round-robin flight contested Friday and Saturday. The team is captained by Eileen Melniker and features Jennifer Pollack Reiner, Laura Gabella, Kerri Weingard, Diane Ventura, Katharine L Levitt, Lucia Hoffman, Karen A Urban. The top four teams in order of finish are: New England, Eastern, Southern California, and Middle States. A month earlier, the men’s team from Westfield, NJ, representing the USTA Eastern Section, finished in fourth place at the USTA League 2.5 Adult National Championships held at the Mission Hills Country Club in Rancho Mirage, California. The team is captained by Edward E. Poole and Marcy Borr, and features Marc Robert Benou, Arnold Resurreccion, Mark Stellwagen, Herbert Joel Kessler, and Christian Richard Baker. The three teams that finished above Eastern, in order, were: Caribbean, Northern California, and Southern. This year’s USTA League 2.5 Adult National Championship drew the top 26 teams (9 men’s and 17 women’s) from throughout the nation. This year marks the 32nd anniversary of USTA League. Since its inception in 1980, it has grown from 13,000 participants in its first year, to over 835,000 players across the nation today, making it the world’s largest recreational tennis league. USTA League was established to provide adult recreational tennis players throughout the country with the opportunity to compete against players of similar ability levels. Players participate on teams in a league format, which is administered by the USTA through its 17 Sections. The league groups players by using six National Tennis Rating Program (NTRP) levels, ranging from 2.5 (entry) to 5.0 (advanced). USTA League is open to any USTA member 18 years of age or older. It features Adult and Mixed Doubles divisions, as well as a Senior Division (age 50 or older) and a Super Senior Division (age 60 or older). 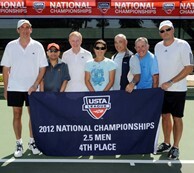 For the 2013 National Championship season, USTA League is changing its structure and format. The change will allow USTA League participants among three age categories (Adult 18 & Over, Adult 40 & Over and Adult 55 & Over and Mixed 18 & Over) to better align participants with players their own age. The restructuring guarantees more frequency of play opportunities at more appropriate age divisions.